One week after Easterns, it was time for Westerns, and the Polar Vortex made the trip for both weekends. 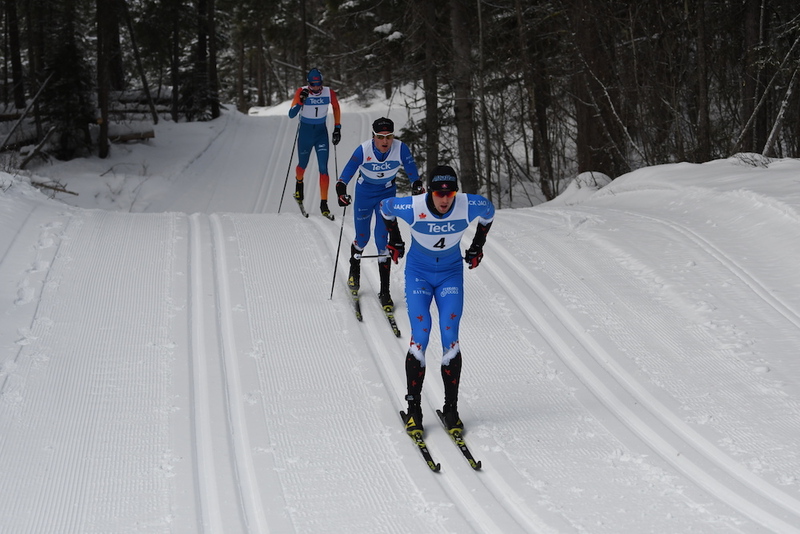 At Easterns, the air was cold enough to keep the organizing committee on edge at the start of the weekend, and freezing rain complicated driving plans. At Westerns, the cold weather held off to Sunday, but falling snow on dry, salted roads created a sheet ice for Friday’s commute. Both championships had less athletes than expected, with driving conditions and weather predictions having an effect. Photo albums and result links follow the daily summaries. The action kicked off Friday with skate sprints at the Telemark Nordic trails near Kelowna, B.C., in sunshine and -11C. Benita Peiffer (Whistler) won the 1.3km A final in 3:02.79, 0.10 seconds ahead of top qualifier Katie Weaver (RMR). Elizabeth Elliot (AWCA) took third, 2.77 back after qualifying second. Peiffer and Elliot grew up racing together before Elliot moved to Canmore, and were clearly enjoying racing together again, completing each other’s sentences during the post-race interview. Tactics were also a shared vision. The open men raced the same course and Julien Locke (CNST) was in dominant form, winning the qualifier and each heat by over 3 seconds, taking the A final in 2:28.23. “I’m just here to race hard,” Locke said after his cool down ski, “so I just raced hard every round.” Locke has been fast in 2019, winning the sprints at US Nationals, Easterns, and Westerns, but he would probably trade any one of those to improve on his second place at the World Championships qualification sprint at Bishop’s University. Junior national team member Rémi Drolet (Black Jack) outreached Telemark’s own Gareth Williams (CNST) to take second, 3.42 behind Locke and 0.03 ahead of Williams. 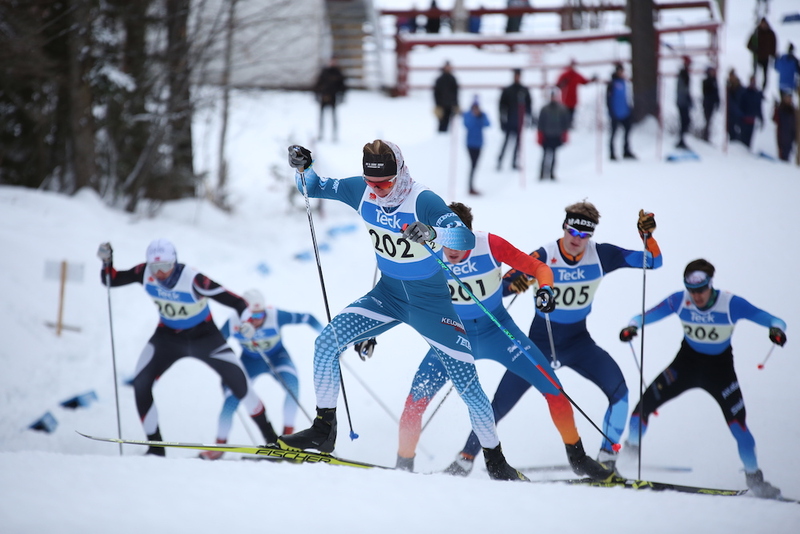 Williams was bouncing back after getting ill on the trip home from U23’s in Lahti and leaving Easterns without starting a single race. 312 athletes raced in good conditions on a day where the driving conditions were anything but good. 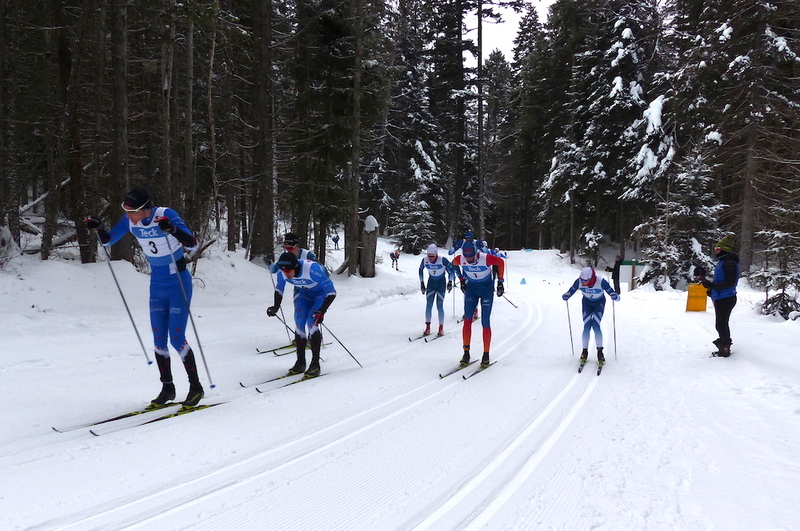 The new 5km loop at Telemark received a homologation certificate less than a week before the event, but it was immediately put to use with the men doing three classic laps and the women doing two in -11C air and intermittent light snow. The men raced first, with Locke, Drolet, Williams, and Sam Hendry (Team R.A.D.) taking an early lead. Williams dropped out early in a race he probably shouldn’t have started. It is hard to miss a race for illness, and harder still when the local tv station is there to see their hometown star, and your mum is the race secretary. Black Jack teammates Locke and Drolet put the hurt on Hendry early, before Drolet broke clear to win alone in 42:18.4, 4.8 seconds ahead of Locke. Hendry hung on for third, losing 42.2 seconds on the final lap. The open women’s 10km was all about the next generation. Novie McCabe (Methow) got away early to win in 32:42.6 minutes. Black Jack teammates Jasmine Drolet and Molly Miller were second and third at 53.4 and 1:28.1 back. All three are in the junior girls category and competed at Junior Worlds in Lahti. 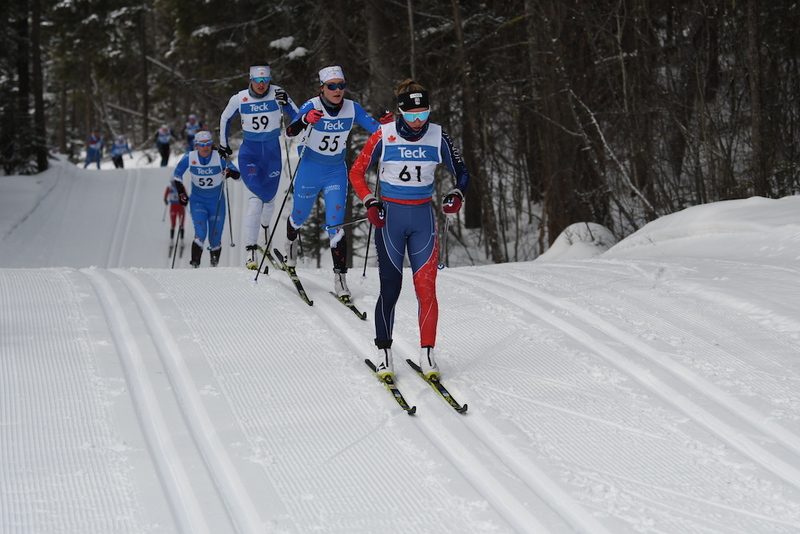 Among the 386 racers were some of Canada’s para-nordic team, here to prepare for World Championships starting the following Saturday. The temperature, despite predictions, reached -17C by 9:00, allowing the relays to start on time. For most, the relays are really about having fun with friends. The results are summarized in Sunday’s rundown. 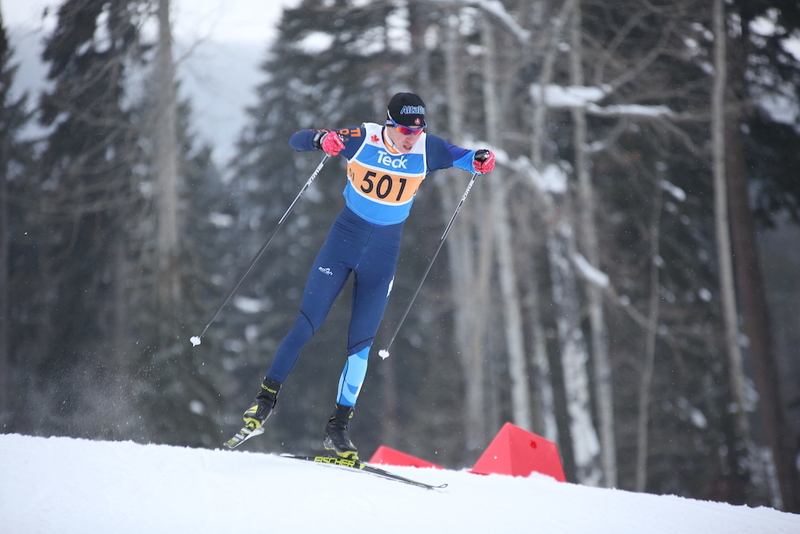 105 teams braved the cold to enjoy another good event at Telemark. “It’s really nice to just be able to come up here and have some great competition and the races are really well organized.” — McCabe, on crossing the border from the Okanogan Valley in Washington state to the Okanagan Valley in B.C. On zone4 results, click on a skier’s name to pull up pictures of that athlete in the selected event. Greg Redman, featured here, is one of the photographers contributing. There are a lot of photos, with over 60 photos of some athletes in some events. Note that masters and the youngest athletes are in the Okanagan Cup links under Full Weekend, and some of the para athletes competed in the open category for the classic race.